Teeth problem is the main problem in recent days like cavity. Endodontic - this is the surgery of root of the teeth. Prosthodontics - this is the surgery involving crowns, the artificial coverings of the tooth made from a variety of biocompatible materials. The recentdevelopment in dental medical field is the successful application of dental implants. Since its appearance, the procedure and due to many advantages it demonstrated itself worthy of further use. Implant dentistry is the major breakthrough for people who lose their teeth due to accident or natural process. It has evolved into the mainstream of restorative practices around the world. Maintenance of bone after tooth loss to improve or maintain facial aesthetics and improved holding, function, and performance of detachable restorations are only some of the advantages for the edentulous patient. No longer are implants considered only when traditional restorations cannot be fabricated. Many medical reports specified that implant restorations last longer than those on teeth and the support teeth are at less risk of loss or complication. Dental implants are auxiliary tooth roots. According to ADA (American Dental Association), dental implant as "a device specially designed to be placed surgically within or on the mandibular or maxillary bone as a means of providing for dental replacement". Medical experts described dental implants as an artificial tooth root (or “post”) made of titanium that connects to the jawbone and supports a crown. After being inserted into the jawbone via a short surgical procedure, the post must osseointegrate (fuse) with the jawbone so it is inflexiblyattached in position. Once the osseointegration process is complete (which can take anywhere from 3-6 months), asupport is attached to the post. The abutment protrudes above the gum line and provides the surface that the dental crown is screwed or cemented onto. The implant generally has a titanium base that is in physical relation to the bone of the jaw and that provides support for the other tooth-like prosthetic part of the implant, called a crown. Implants are of several types, they are prepared in different ways, and they are made of different materials. Implants provide a strong foundation for fixed (permanent) or removable replacement teeth that are made to match patient's natural teeth. When planning for dental implants, it is must to consider the general health condition of the patient, the local health condition of the mucous membranes and the jaws and the shape, size, and position of the bones of the jaws, adjacent and opposing teeth. There are few health conditions that completely impede placing implants although there are certain conditions which leads to failure. Those with poor oral hygiene, heavy smokers and diabetics are at high risk for a variant of gum disease that affects implants. This is called peri-implantitis, increasing the chance of long-term failures. Long-term steroid use, osteoporosis and other diseases that affect the bones can increase the risk of early failure of implants. Dental implants are posts that support replacement teeth. They fit directly into patient's jawbone and hold false teeth in place in the same way that roots support natural teeth. Most dental implant surgery techniques are done in the dentist's office and occasionally in a hospital setting. For implanting tooth, first step is to give local anaesthesiawhich is usually adequate for these out-patient procedures but various other forms of patient sedation (such as nitrous oxide, and oral/or intravenous sedation) may also be used. Adjunctive surgical procedures, such as bone augmentation, may be performed as separate procedures or at the same time as implant placement. Each surgical procedure is different depending on the clinical situation as well as the choices of the patient and dental surgeon. For performing dental implants, most common procedure is a "staged surgery" procedure. The first stage comprises of surgically concealing the implant (which replaces the tooth root) flush with the bone but underneath the gum. This protects the implant from force while it is healing. At the end of this healing period, the implant needs to be surgically exposed by removing some of the overlying gum. In second stage, dental surgeon thoroughly checks the implant for its successful integration and connects some form of post which enters through the gum into the mouth. This post is called the support. Abutments come in many forms and can be stock-manufactured or custom-moulded by dentist and a laboratory. The gum is allowed to heal around the abutment and form a cuff or collar through which the dentist has access to the implant when preparing the final restorative stage of placing the prosthetic tooth or teeth. Several medical studies have demonstrated that it is often possible to place a suitable abutment at the same time as the implant. This has some limitations but can eliminate the need for a second surgery to expose the implant. Nevertheless, the implant still requires proper healing time for the bone to osseointegrate. Doctors advise to patient that the abutments must also be protected from chewing forces during this period to guarantee effective bony integration and proper healing. Once the implants have had a chance to heal and have been tested for successful integration, the final restorative step occurs. This stage include fabricating and connecting the prosthetic teeth to the successfully Osseo integrated implants. Medical studies have indicated that implants can be placed either using a one stage or a two stage surgical technique. One is performed in one step while the other techniques needs a second surgery. One-Stage Surgery: In this technique, surgeon employs a non-submerged one-piece implant that has a metal collar designed to protrude through the gum while the bone is healing to the implant. 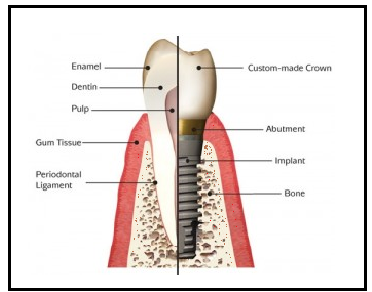 After a proper healing time, an abutment can be connected to the implant, allowing for fabrication of the crown to replace the missing tooth. On the other hand, a one-stage procedure can be completed by immediate connection of a temporary healing abutment to a two-piece implant that protrudes through the gum in much the same way as a one-piece implant. A two-stage procedure: This procedure is typically used to replace teeth where there is no immediate need for a cosmetic solution and when more of a margin of safety is required. With this approach, the implant(s) are placed into the jawbone and the gum tissues cover them. They are not exposed to the mouth, but stay buried and left to heal. Once properly healed, a second surgery is done to attach an abutment for securing the crown in place. This procedure is used when there is poorer bone quality or quantity. This may make it necessary to regenerate bone around the implant at the time of its placement. Both single stage and two-stage implants have same success rates. Patients can consult to dental surgeon about which procedure might be appropriate for him. The area of the mouth that is missing a tooth is identified. An area with a single missing tooth. Cut is made across the area and the flap of gingiva is opened to show the bone of the jaw. An incision is made across the gingiva, and the flap of tissue is reflected to show the bone of the jaw. A series of slow-speed drills create and gradually enlarge a site in the jaw for the implant to be placed. The hole is called an osteotomy. Once the bone is exposed, a series of drills created to gradually enlarge a site (called an osteotomy) for the implant to be placed. The implant fixture is turned into the osteotomy. Ideally, it is completely covered by bone and has no movement within the bone. The implant fixture is turned into the osteotomy. Preferably, it is completely covered by bone and has no movement within the bone. A healing abutment is attached to the implant fixture and the gingiva flap is sutured around the healing abutment. Success rates of dental implants depends on where in the jaw the implants are placed. Medical data have shown that there are 98% success rate of dental implants.If proper care is taken, these implants can last a lifetime. The success rates have improved radically since the advancement of dental implant surgery. Similarly, long-term success rates are in the high 90% range and are similarly improving. When a dental implant has not successfully combined, it may need to be removed, as it cannot easily be "converted" to osseointegrate. Dentist will give clear advice about this. A replacement implant can be placed but it may require some months of healing time and possibly bone augmentation (repair by means of grafting). Implants attach differently to bone than teeth. The periodontal ligament (PDL) is a fibrous attachment that anchors teeth into the alveolus. When the PDL is lost or unhealthy, the tooth becomes loose and tender. Since implants do not rely on PDL’s for attachment, even if the majority of bone is lost around an implant, no mobility is observed. Sometimes, the patient does not have any symptoms when peri-implantitis occurs. Therefore, it is vital that regular dental prophylaxis appointments are planned. If bone loss is identified early, treatment can be administered quickly to restore health around the implants. Home care for dental implants is the same as for natural teeth. Daily brushing and flossing are mandatory to remove plaque build-up, which can cause peri-implantitis. However, patients must follow instructions of the dental team to clean the implants. If regular floss is too small for the interproximal spaces, then proxy brushes should be recommended. Some precautions must be taken before dental implants: Patients with high blood pressure, diabetes, cholesterol should be under control before the implant procedure. The parameters of blood tests especially related to platelet count, blood sugar should be normal. It is significant to refrain from smoking for a reasonably long period of time 3 to 4 weeks before and at least two months after the placement of the implants. The possibility of acceptance of implants in smokers reduces considerably which means there is a possibility of a failure. Today, dental implants are preference of patients who have missing teeth. Dental implant gives healthy, natural teeth. Strong and stable, a dental implant reinstates a lost tooth so that it looks, feels, fits and functions like a natural tooth. Other options can lead to bone weakening, and may interfere with eating, smiling, speaking and other activities of everyday life. Another benefit of dental implant is that dental implants are a long-term solution. Traditional, tooth-supported dental bridges can go for five to seven years, and with proper care often more than 10 years, but they may need to be replaced. While dental implants may need periodic adjustments, they can last a lifetime when accurately placed and cared for over time. With dental implants, people can eat smoothly and enjoy life without any worry for teeth.They can attend the social gathering without any hesitation and embarrassed because individual’s smile looks different and they hesitate to talk, eat or laugh in parties. Patients with dental implant solution can retain their natural face shape, and smile. A face without teeth can sag and appear depressed. Dental implants allow a person to maintain the natural shape of his/her face and smile. Dental implants can also protect healthy bone. If empty spaces in mouth is left as it is after losing one or more teeth, it can lead to other health problems such as the loss and deterioration of some of jawbone. When it is not being used to support a natural tooth, the jawbone deteriorates, losing its strength and firmness. Dental implants are the only dental restoration option that preserves and stimulates natural bone and prevent bone loss. Dental implants allow you to keep teeth where they belong. Dental implants allow to speak easy. Dental implants protect healthy teeth also. Placing a tooth-supported bridge requires grinding away the teeth on one or both sides of the missing tooth or teeth. Thereby damaging healthy teeth to restore those that are missing. The modified healthy teeth are attached to, and support, the bridge. Dental implants go in the jawbone. Major drawback of dental implants is that it is very expensive procedure and difficult for common man to afford. If a person needs multiple implants because of multiple missing teeth then this may cost tens of thousands of rupees. Another disadvantage of dental implant is surgical process involved in this process that may make it a poor choice for some patients. The procedure is time-consuming, each implant requires at least two separate surgical procedures, separated by at least three months of healing time. These surgeries are related with pain, swelling, and other side effects. Dental implant replacement of teeth has become one of the most foreseeable and successful of all techniques in dentistry. Dental implants, while significant, sometime give negative results. Teeth are lost for two major reasons such as decay and periodontal disease. Obviously, dental implants are not subject to decay, but they can fail due to loss of bone support. Peri-implantitis can occur with dental implants in the same way that periodontitis can occur with natural teeth. Patients have to care for their dental implants that they have for caring for their natural teeth. The two most common causes of late implant failure are retained subgingival dental cement and traumatic occlusion. Infection at the implant site. Injury or damage to surrounding structures, such as other teeth or blood vessels. Sinus problems, when dental implants placed in the upper jaw protrude into one of your sinus cavities. 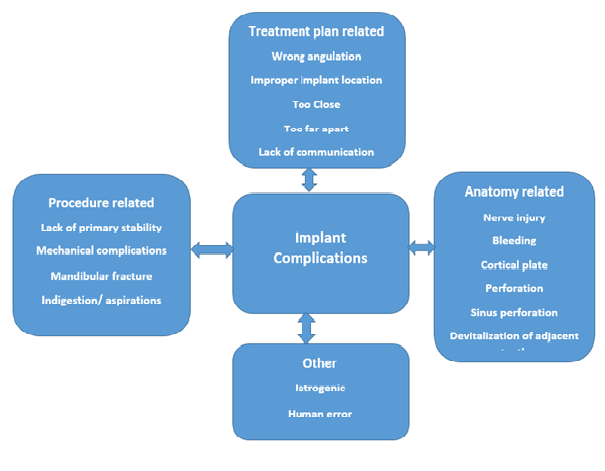 Surgical implant complications are not unusual and should be attended immediately. Causality may be iatrogenic, due to poor treatmenttechniques, or lack of communication between dental disciplines. Time should be spent in the implant “planning” stages, such as tracing preoperative radiographs, measuring models, taking CT scans and making proper surgical guides. Dental implants are artificial tooth roots inserted into the jaw to replace missing teeth.Many implant dentists use 3D images and implant surgical planning software to construct a vivid map of the patient’s mouth, pinpoint potential problems, and plan the implant procedure in advance. During the initial visit, a 3D image is taken to enable the dentist to assess bone structure and nerve locations, plan the surgery, and mold replacement teeth before the next visit. It is stated that Implants are the long-term solution of replacing teeth and provide the best aesthetic effects. In dental field, major advancement is dental implant technology. It iscostly, but best dental restoration method available and cost less in the longer-term because it doesnot need replacement as often as a dental bridge. Additionally, an implant preserves the jawbone and gum tissue and does not require healthy teeth to be grinded down.